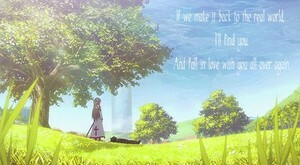 Kirito x Asuna. . Wallpaper and background images in the sword art online club tagged: sword art online asuna kirito gifs. This sword art online photo contains faia and árvore. There might also be carvalho vivo, live oak, árvore, palmeira real, roystonea regia, palma real, and royal palm. Is he showing his strength por crushing the bottle?